Welcome to the all-new Speed Duel format! We’re showcasing Speed Duels for the first time here at YCS Pasadena, and we’ve got a Mai Valentine vs. Maximillion Pegasus Match for you! Devin Liao is traveling here from Taiwan! 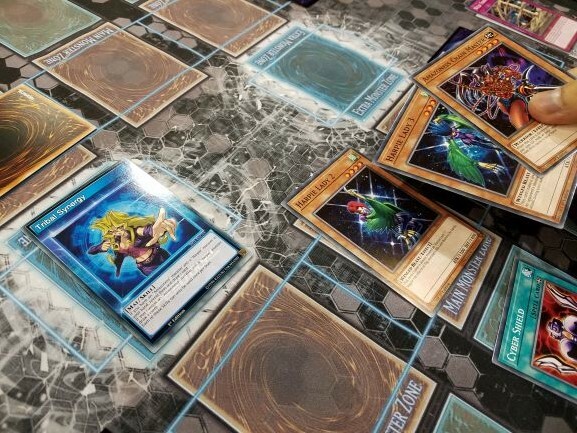 He wanted to check out one of our tournaments, since the Yu-Gi-Oh! Official Card Game uses a different format than we do here. Now he’s one of the first to play in Speed Duels! His opponent is Christopher Huanosta, from Santa Clarita. 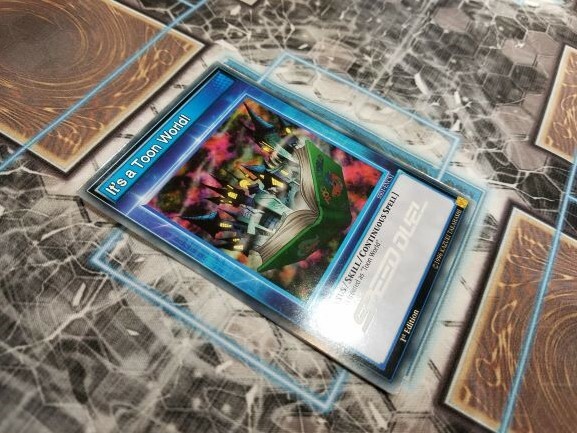 Liao is using Mai, while Huanosta is our Pegasus Duelist. For an overview of Speed Duels, check here! Huanosta won the dice roll and chose to play first. He activated his “It’s a Toon World!” skill! 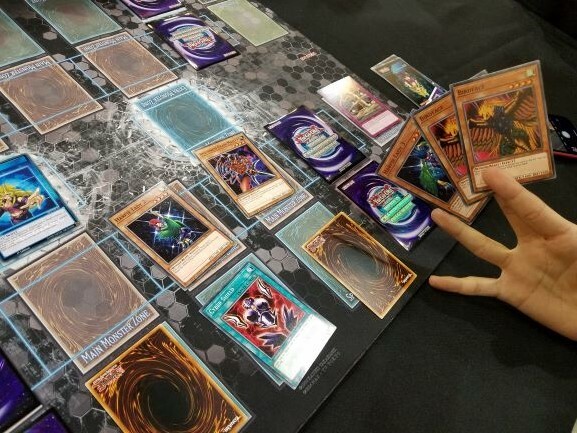 He played Toon Table of Contents, searching his Deck for Toon Mermaid. He Special Summoned his Mermaid and Set another monster. Liao had Wild Tornado, Harpie Lady 2, Harpie Lady 3, Cyber Shield, and Amazoness Archers. He Set Wild Tornado to start, and played Harpie Lady 2. He powered her up with Cyber Shield, and sent it to destroy Huanosta’s Set Toon Alligator. Huanosta played Toon Rollback and sent his Mermaid to attack directly. Liao flipped Wild Tornado, destroying Toon World and Toon Mermaid! Liao drew Amazoness Chain Master, and activated his “Tribal Synergy” skill! He drew Shadow of Eyes and Birdface. Then, he Summoned Chain Master and used the second part of the skill to draw two more cards! He attacked with his monsters, and Huanosta conceded! Huanosta bega, using “It’s a Toon World!” once more. He Normal Summoned Toon Masked Sorcerer, then Tributed it to Special Summon Toon Summoned Skull! He Set one back row card. Liao had Triangle Ecstasy Spark, Windstorm of Etaqua, Elegant Egotist, Birdface, and Amazoness Sage. He Set Birdface and Windstorm. Huanosta attacked, and Windstorm blocked the attack. Liao drew Sonic Shooter. He Flip Summoned Birdface and Normal Summoned Sonic Shooter, sending the Sonic to destroy Toon Summoned Skull in battle. Birdface attacked directly. Huanosta looked at his next card, and wasn’t able to defend his Life Points another turn! 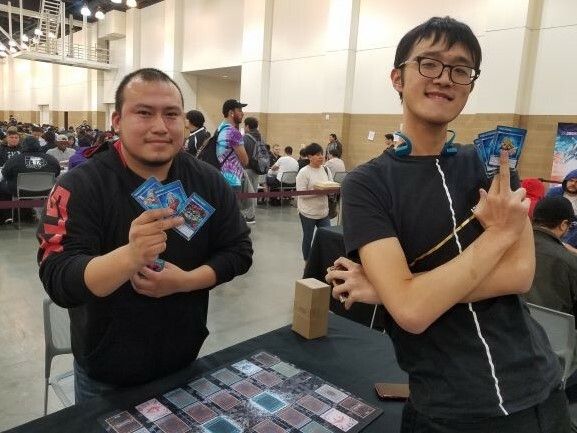 Devin Liao wins the Speed Duel with his Mai Valentine Deck! Round 5 Feature Match: Brian Ramirez vs. Connor Farmer Get Ready for SPEED DUELING! !